I’m grateful to have met Anna Lebedeva, of Green Holiday Italy. She’s a freelance journalist and passionate follower of the Slow Travel movement, who lives in the region of Abruzzo, and travels up and down the boot in search of the best traditional food and hidden corners. 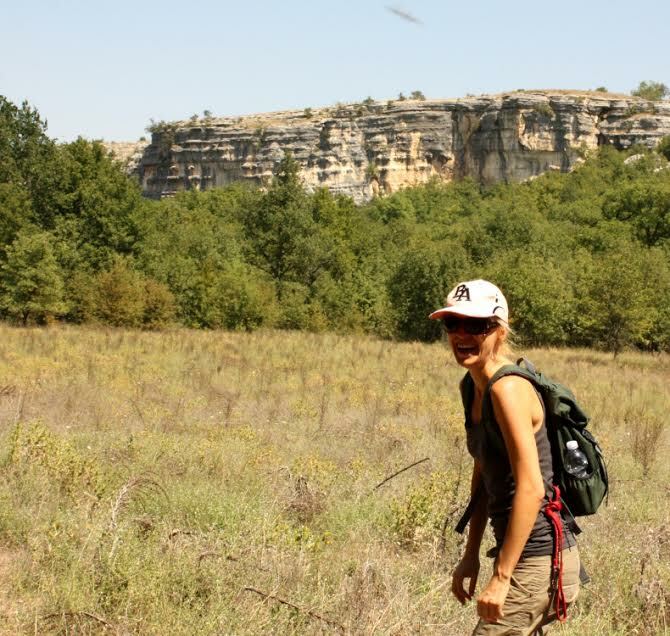 Anna has a beautiful blog, www.greenholidayitaly.com, where she writes about such fascinating things as Birdwatching in Rome and the village of Cerchiara, Calabria, which was recognized by the Slow Fo od Movement in 2012 as having The Best Bread in Italy. I’m so glad Anna is joining in to give her advice for a Golden Day in Civita, Calabria. Civita is one of the prettiest villages in northern Calabria. 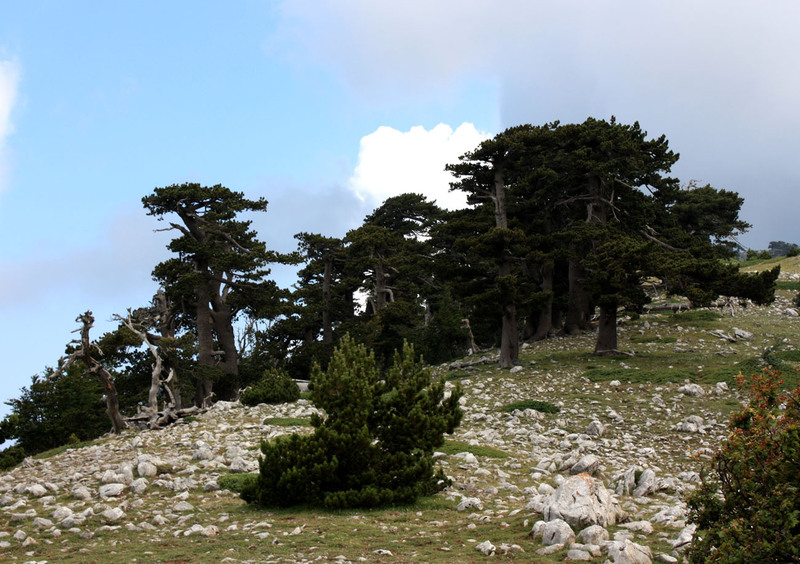 In the 15th century a group of Albanian refugees fleeing from the Ottoman invasion settled here. 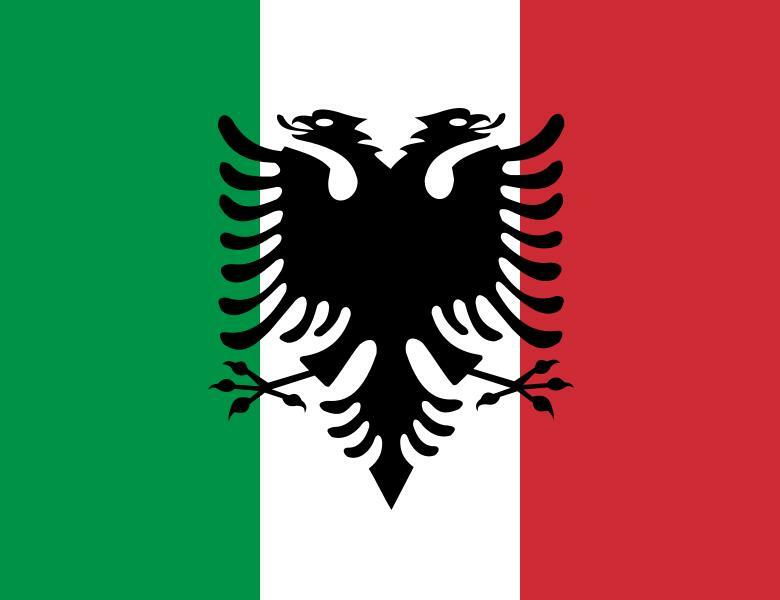 The locals still speak the Albanian (arbëreshë) language and are proud of their ancient traditions. 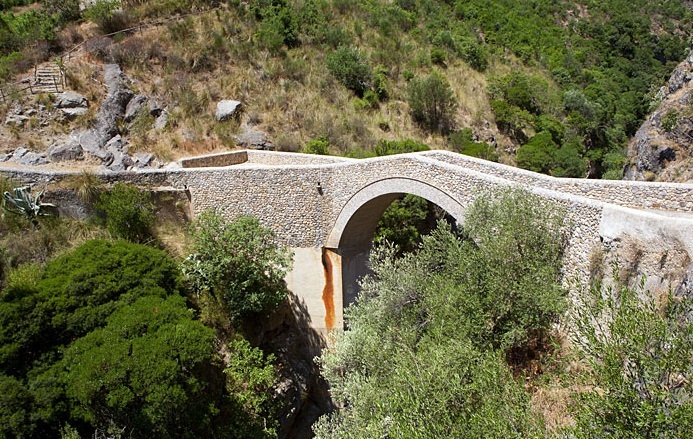 Just outside the village you’ll see the spectacular Devil’s Bridge.The local legend has it that a clever villager struck a deal with the Devil, who promised to build a bridge in exchange for the soul of the first creature who crosses it. When the bridge was erected the villager pushed a dog which ran to the other side, saving his own soul. 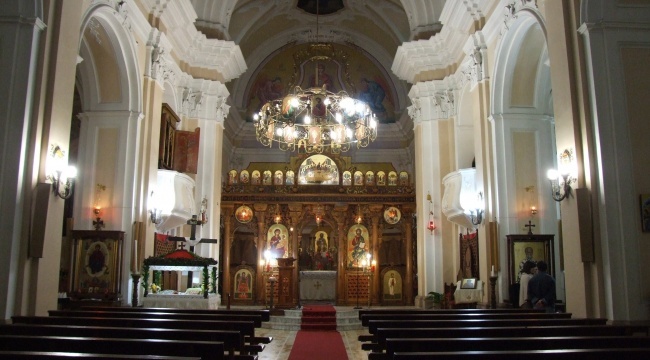 The local church of Santa Maria Assunta has stunning Byzantine mosaics. 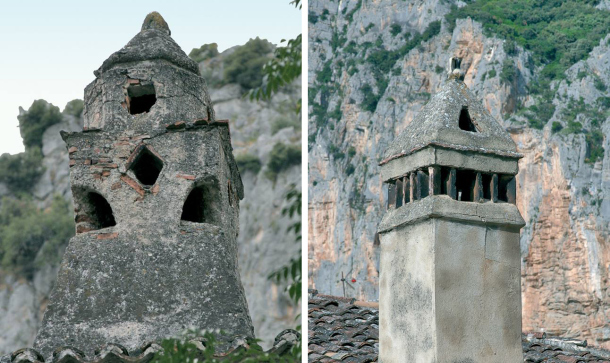 Take a walk around the village to see traditional Kodra houses that look like human faces. 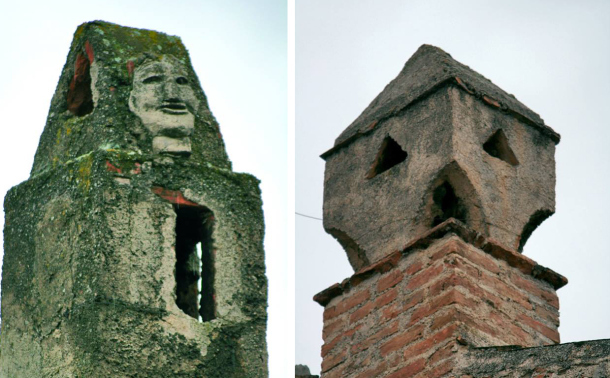 The village is also known for its beautiful old chimneys, each of them is different. 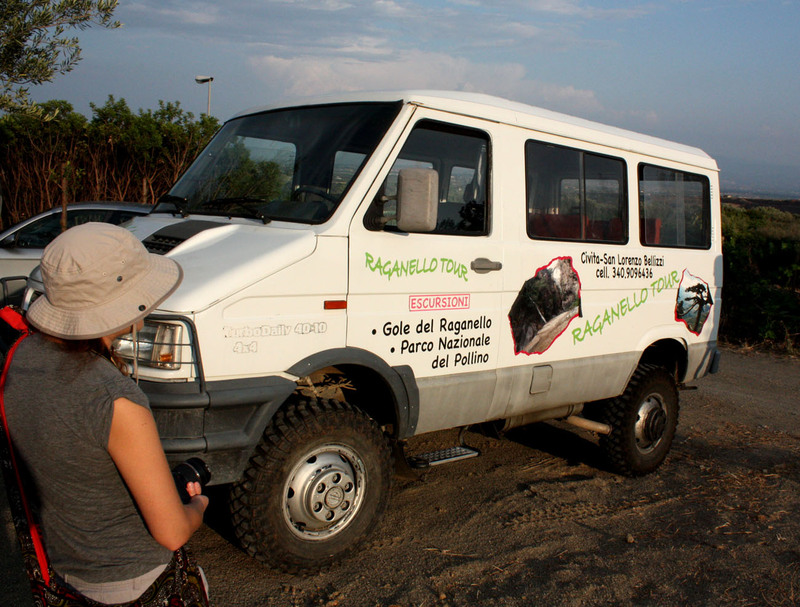 Or, for adventurous travelers looking for off-road trips in the area, call a small company Raganello Tour, 3409096436. As far as restaurants, Kamastra is a fantastic place to sample local specialties. The owner, Enzo, is a lawyer, but he also writes music for traditional arbëreshë songs. He will tell stories and recipes for his tasty dishes such as slow-cooked goat meat with laurel leaves, marinated onions, the scrambled eggs with peppers (called “the shepherd’s breakfast”). 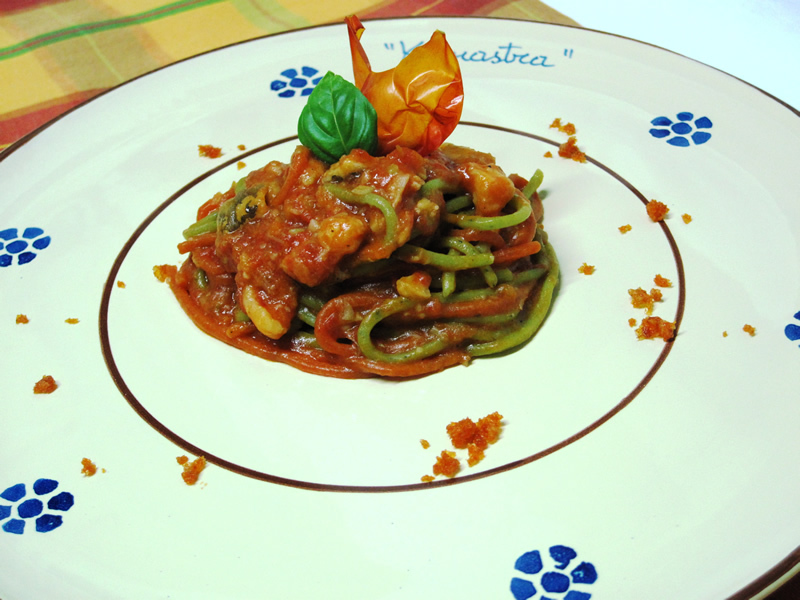 The home-made pasta dishes here are absolutely to die for! Another good restaurant is Agora. It might lack in the atmosphere but the food is excellent here too. 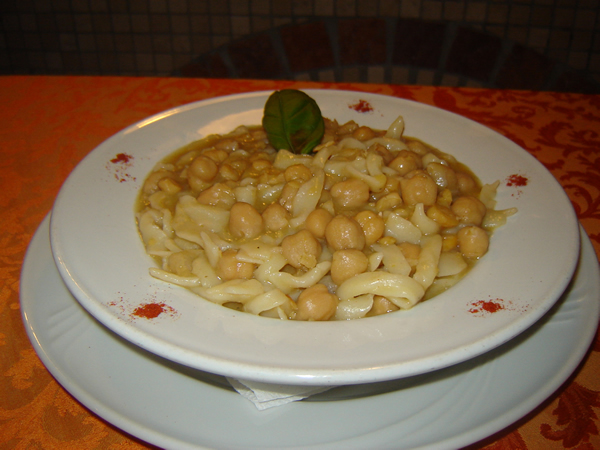 I loved their Agora starter, which is a mix of local meats and cheeses, and home-made pasta tumàce with chickpeas. Here are some good options to stay: B&B La Magara is a mix of beautifully restored old interiors with a modern touch. Views of Civita from some rooms are amazing! Antonella is a bubbly and friendly host. She serves a big breakfast of local specialties. Check out the chimney on their roof: it is one of the oldest in town. 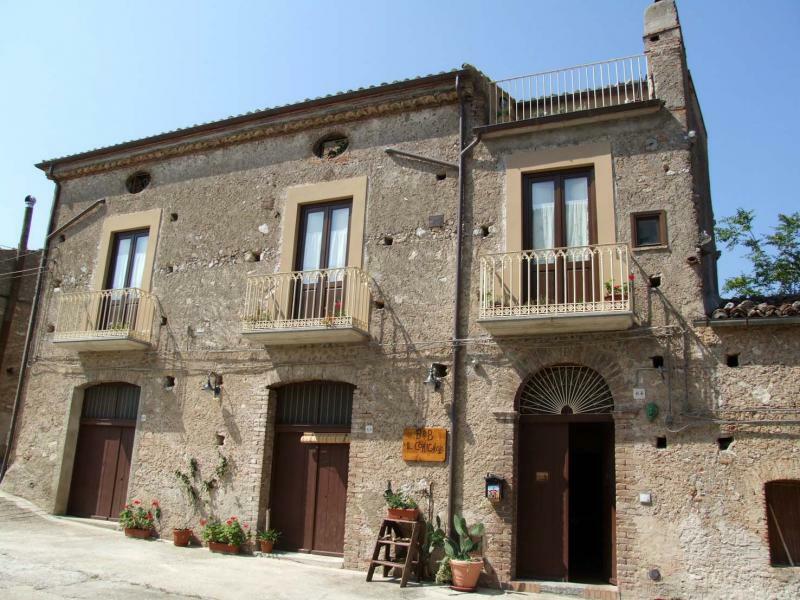 Another lovely B&B is Il comignolo di Sofia. Stefania is a real expert of all things local and knows the area very well. She can organize tours and cookery classes for you. There are only two rooms but the atmosphere is beautiful. You will find many books on the arbëreshë traditions in the house. Grazie mille Anna, I’m hungry for Civita–Hope to get there soon! Thank you for this really informative post. I really enjoy staying at B&Bs sometimes to get the real flavour of a place. These choices sound perfect. Do you have anything about San Giovanne in Fiore? We do not at the moment, are you interested in doing a post about San Giovanne in Fiore? This is one place I would love to see when I explore southern Italy this next May! Andiamo, That makes two of us!